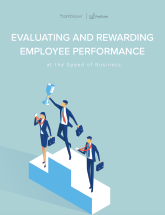 Matching employee performance with appropriate compensation has been a business consideration since the first boss hired her first employee. But as any manager or human resources team member can attest, in the current hyper-competitive business environment, adequately compensating top-performers is more important now than ever before. In every corner of private industry – whether for-profit or not-for-profit – the days of across-the-board living increases are long gone. Instead, employers are motivating and recognizing employees by creatively layering base and variable pay with perks like flexible schedules, free coffee, professional subscriptions and gym memberships. Pay for Performance is an equation in which some portion of an employee’s compensation is related to how they perform based on some stated criteria. And within the equation, it’s crucial to get the balance right. When the pay performance equation gets out of balance, it can lead to employee dissatisfaction. Read our ebook to learn how to get pay for performance right.